The first few times she tried to recruit people for an environmental health risk study, Justina (Cooney ’13) Lara met some wary and puzzled faces. It didn’t help to mention brain tests. The whole thing just requires a lot of explaining. Senior chemistry major Philip Albornoz uses gas chromatography–mass spectrometry in one part of the study. “Even if they hadn’t paid me over the summer, I would have done it,” he said. On the other hand, the political science graduate has been pleasantly surprised at the interest that the prospective study subjects demonstrate once they learn more about CLU’s multi-year research project, supported by two grants worth $250,000 from the California Wellness Foundation. The project seeks to evaluate various risks of pesticide exposure for people who work on or live close to farmland in Oxnard, and to give them new ways to respond to the risks. Approached through trusted organizations in their communities, the farmworkers and others had questions (in English, Mixtec and Spanish) and often wanted to get involved, according to faculty members and students on the project. They answered confidential surveys and submitted urine samples. Some of those fluent in Spanish have also sat for three-hour assessments that included tests of their attention, memory, information processing, motor speed and visuospatial skills. In many ways, the subjects of all of this research are also the most important audience for it. In a survey that was distributed at community events, 71 of 101 respondents said that they were concerned about the quality of air and water where they lived. Still, only one of them had spoken with a public official about the concern, and few reported any involvement in community groups or awareness that environmental issues were ever discussed. Their most common pesticide-related health concerns were allergies and asthma – and not, for example, an elevated risk of certain cancers. “I was surprised that so many people wanted information and didn’t seem to have access to it before,” said Lara. The interdisciplinary project has generated excitement on campus in Thousand Oaks as well as Oxnard, where CLU’s Doctor of Psychology program is based next to the fields. This is a grand, multi-faceted effort of the sort you more often find at research institutions like the UCs. At the same time, the project is right at home at Cal Lutheran, given the opportunities it creates for students to gain both specialized expertise and skills needed to bring about social change. 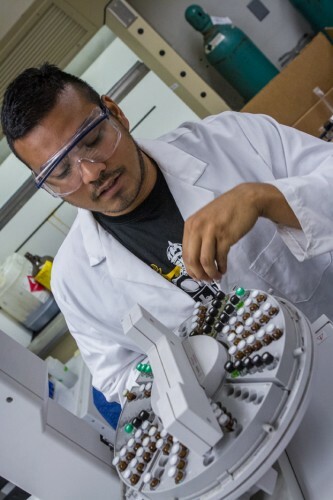 For example, since all of the environmental test samples go to him, chemistry major Philip Albornoz has grown very comfortable with gas chromatography–mass spectrometry. With the GC-MS instrument, he identifies chemicals in the samples, including pesticides and metabolites of pesticides produced in the body. Meanwhile, Liz Ornelas, a doctoral student in psychology, looks forward to administering those three-hour assessments. “It’s fun,” she said. In the portion devoted to “objective” cognitive tests, the trained examiners scrupulously follow a flow chart of prompts – a dynamic script that avoids commentary or anything that could either discourage or cheer the participants. There’s a balance to strike, since examinees need to feel comfortable and since “keeping them motivated is part of the testing process,” Ornelas said. Participants move through tasks such as repeating series of numbers forward and back, and naming colors on cards as fast as they can. Although similar tests have been part of previous research on pesticides, CLU’s interdisciplinary approach makes this study distinctive in at least two ways. First, the data set that is being assembled, though limited in size, promises to have a lot of explanatory power. For example, when assessing the health risks of pesticide use, researchers will be able to look at the presence of pesticide metabolites in urine and the distance that participants live from fields as independent variables. They are also considering socio-economic factors such as possible correlations between pesticide exposure and household income. Secondly, all of the policy recommendations that come out of the project will have empirical data behind them, as opposed to ideology. “In social justice work, that’s extremely rare,” said political science professor Haco Hoang. For almost three years, Hoang and her students have been thinking about what resources Oxnard residents can use to develop their awareness of environmental issues and engage in dialogue. They’re also looking carefully at what’s stopping people from using the resources they have. In this case, the barriers to civic engagement include language and a host of fears that have to do with retaliation at work and, sometimes, immigration status. Because listeners don’t have to identify themselves when they call in, the researchers have taken an interest in popular radio shows, which survey respondents identified as a major source of news. As part of the study, Kaitlyn Noli ’11 assessed selected shows’ coverage of various topics, and discovered a void of talk about pollution and the environment.